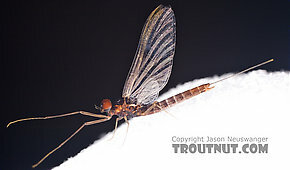 Though usually noted for migrating to the shallows to hatch, most species at times emerge in classic mayfly style on the surface and ride the water for a while before flying away. This is exacerbated by the inclement weather they often hatch in. Floating nymph patterns and emergers are very effective at these times. The hatch may last for a few hours each day. 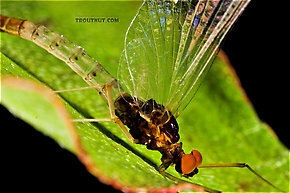 George Edmunds in Mayflies of North and Central America documented that Paraleptophlebia mayflies have been observed to emerge by crawling out onto shore when the water is high in the Spring, but since he gives no further details about which species do this it is reasonable to assume it's generic. Knopp and Cormier note in Mayflies: An Angler's Study of Trout Water Ephemeroptera the same behavior. According to Edmunds, the females will mate more than once and often proceed to shoreline foliage when finished with ovipositing as opposed to dying spent (Spent: The wing position of many aquatic insects when they fall on the water after mating. The wings of both sides lay flat on the water. The word may be used to describe insects with their wings in that position, as well as the position itself.) on the water. The males start the swarms first, often well before. They are often observed along the shoreline dipping from six to two feet and rising again. On occasion, many males for unknown reasons drop to the water at this time and become trapped in the meniscus. When the females finally arrive, they join them quickly at the top, copulate during the four foot fall, and just as quickly make short dives to either dip their abdomens into the water or land on the water to lay their eggs. Then it's up and back at it until they're finished. Edmunds reports that they will repeat this cycle as many as three times before they occasionally die spent (Spent: The wing position of many aquatic insects when they fall on the water after mating. The wings of both sides lay flat on the water. The word may be used to describe insects with their wings in that position, as well as the position itself.) on the water or more often head back to the bushes. This is good information for the angler to note. Although classified as crawlers, Paraleptophlebia nymphs look more like little burrowers (especially the tusked variety) and swim very well. 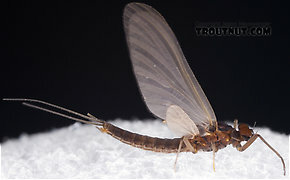 They are generally tolerant of faster water than Leptophlebia and inhabit pockets in riffles as well as moderate runs.